Passed away peacefully, surrounded by his family, on Friday, April 5, 2019 at Prince County Hospital in his 95th year. 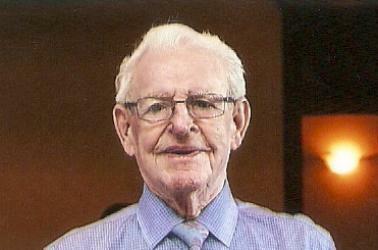 Beloved husband of Noreen (Trainor) for 70 years. A devoted father, grandfather, great grandfather, uncle and brother-in-law, he was loved by all. Left to remember and love Dad are: Maureen and her children Stephanie, Geoffrey and Lorraine Clappison; Maurice, his wife Cindy and their sons Josh, Joseph and James and grandsons Jerome and Jacob; Ben and his children Mary Ann, Robyn and Aaron; Mary McCarvill and her children Rachael, Rebecca, Terrance, Darcy, Liam, Mary Ellen and Bennett, and her grandson Edward; Charles and his children Nicholas and Kelsey; Leonard, his wife Debbie and children Jessica and Dylan; Jamie, his wife Michelle and sons Patrick, Evan, Sean and Bryce; Amy Duffy, her husband Pat and children Matthew, Teresa, William, Marianne and James, and grandchildren Jack, Annie, Mariah, Violet and Vivian. He will be sadly missed by his sister-in-law Agnes Smith (Linus) and brother-in-law Saint Clair Trainor (Clara). Predeceased by his son Terrence (1957), grandson Jason Smith (2017) and son-in-law, Paul McCarvill (2012). Born in Brookvale, PEI on August 10, 1924, Frank was the youngest of 14 children of Jerome and Maria Smith, and the last surviving member. He left PEI to enlist in the Army when he was 17 and served in Europe and Canada during and after World War II. He re-enlisted in the RCAF in 1954 and served more than 25 years in the Canadian Military. Upon retirement, Noreen and Francis returned to PEI and made their home in Kinkora where Dad embarked on his third career as civilian employee at CFB Summerside and worked summers at Cavendish Park. He made long lasting friends wherever he went and wherever he worked. Visitation on Wednesday, April 10, 2019 at Kinkora Place from 4 to 8 pm. Funeral Thursday, April 11, 2019 at 10:30 am at St. Malachy’s Church, Kinkora. Interment later in the parish cemetery. In lieu of flowers, donations to PCH Foundation, QEH Stroke Unit or St. Malachy’s Cemetery Fund would be appreciated by the family. Arrangements entrusted to Lawless Funeral Home, Kinkora.